Well folks! The time has come. Today’s post officially wraps up the 12 Days of Christmas. Have no fear though, we saved the best for last. First, I want to announce some winners! Over the course of the 12 Days, I hosted three giveaways here on IBC. Thank you to everyone who entered. All 12 winners will be receiving emails today or tomorrow with more information. So stay on the look out. Of course, you are welcome to check out the other blogs to see if your name has popped up on any of their lists. Winners’ names will appear in the Rafflecopter widgets below. Again, please give the widgets a few seconds to load. As I mentioned above, we decided to save the best for last! It’s your turn to show us your Christmas cheer! You will notice there are five fabulous Link Parties. I have linked all of them below so that you can easily find the appropriate one to link up to. it’s the little touches and details that make your holiday decorating special. 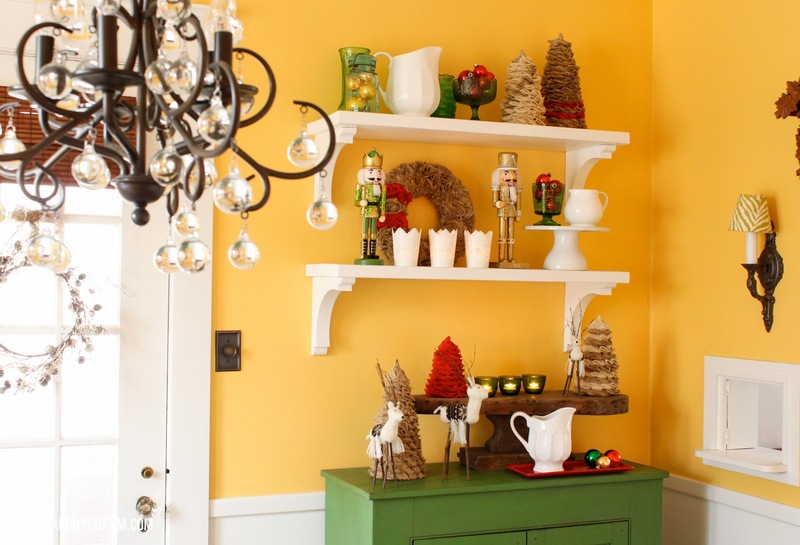 Re-imagine what you have, use what you love, and you will have a perfectly decorated home for the holidays. So bring it on! Let’s see your holiday magic! Please note, that by linking up to this party, there is a good chance we may be sharing your projects all over our social media pages (linking directly to your fabulous blog or website, of course). Thank you so much for hosting the link party Michael, as well as sharing all of your wonderful Christmas ideas. I love watching you decorate for each season! Merry Christmas! You are MORE than welcome! Thank you so much for following along. I can’t wait to see what you created! I really enjoyed the 12 Days of Christmas series! Thanks for hosting the Quick and Easy Decorating Party! This has been so much fun! I loved having coffee with you every morning and be inspired by your endless creativity and Christmas decor! Have a blessed and very Merry Christmas and a Happy New Year! OMG! I know, right?? I loved it! The same goes for you. Your house an your talents AMAZE me! Wow!! Merry Christmas! Thanks for hosting the fun Michael! What an inspirational party! 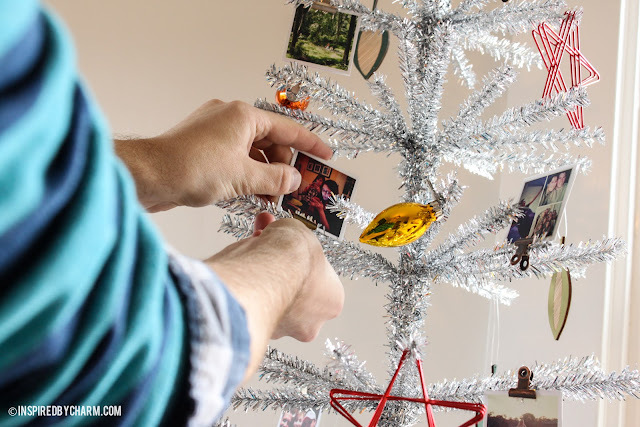 I absolutely adore your tinsel tree with the photos clipped on – so creative! Have a wonderful day and Merry Christmas! I had so much fun!! Merry Christmas! Thank you so much for hosting this party, Michael – I love all of your pins and follow your home decoration with great interest. May you have a Merry Christmas and a lovely New year to look forward to. Wow so excited you are hosting a linky party! Love all your pins and I’m so excited to see everyone’s ideas – thanks! Thanks so much for hosting! I’m your newest GFC follower. Have a Merry Christmas! Just linked up a couple of my projects!! Thanks so much for hosting Michael!! Thanks for hosting this fun party and sharing your beautiful Christmas decor. We did it! We finally worked together in some capacity. It was long overdue and I’ll admit, I have a die hard habit of wandering over here each morning with hot coffee in hand to check out your latest. And what a lovely habit to have! Merry Christmas M, and thanks so much for playing with us 12 Dayers and for your generosity with your time! 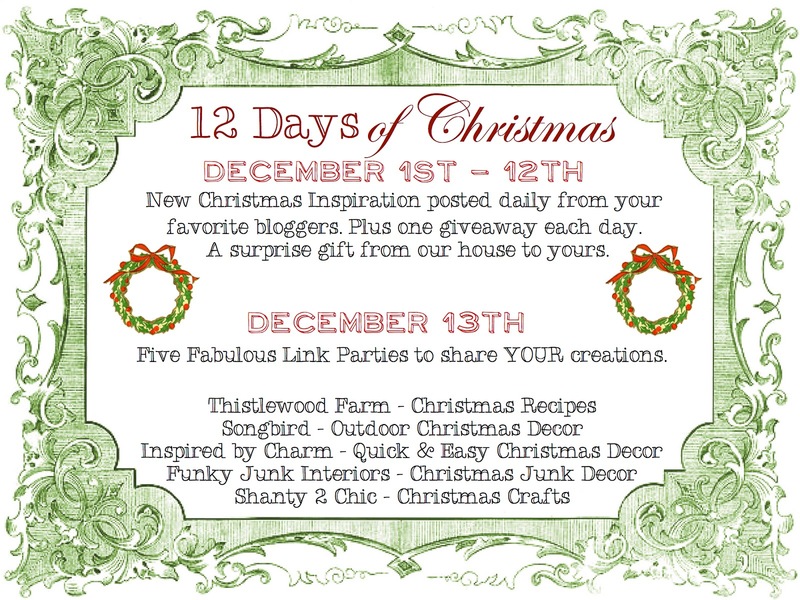 I’m linking up my Sparkle, Shimmer & Twine Holiday Project. I’m your newest follower, via Shanty-2-Chic. I’m looking forward to catching up on your posts! Good morning! I hope I’m the lucky Cheryl that wins the burlap ribbon! Why didn’t I use my last name so I know for sure?! This party has so much fun and given me several ideas to use in my own home. Great idea and I hope you all do this again next year! This series was such fun! I have felt so blessed that you wanted to play along with me. Thank you and have a wonderful Christmas and the best New Year! I have enjoyed the 12 Days of Christmas series, but I must admit it was with a Dr. Pepper instead of coffee that everyone else mentions! Thank you ofr hosting and Wishing you a Merry Christmas! Hi Michael! I’ve seen you all over pinterest but this is my first time visiting. LOVE your blog. Totally your newest subscriber! I linked up my kissing ball & Christmas art; thanks for hosting! Thank you so much for hosting Michael! I have thoroughly enjoyed following along on the 12 Days of Christmas journey! Many blessings this season to your and yours and many wishes for a wonderful New Year! What a fun series Michael – loved seeing what you and all your co-hosts came up with each day! Now, take a break and have a cocktail! this has been a wonderful 12days–so much inspiration! hope you can do it next year, too:) thanks for hosting us! Hi Michael. Thanks for not only letting me link up but for hosting such a fun linky. 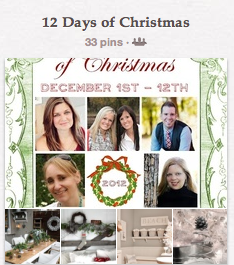 I’m really enjoying all the beautiful photos and great links for the 12 Days party.